I spent a lot of time researching trainers in my area, trying to find someone that would start Tally under saddle in the manner I wanted. I thought that I’d made a careful selection, and I thought that my expectations were simple – I wanted Tally to just be able to stop, go, and have some basic steering. 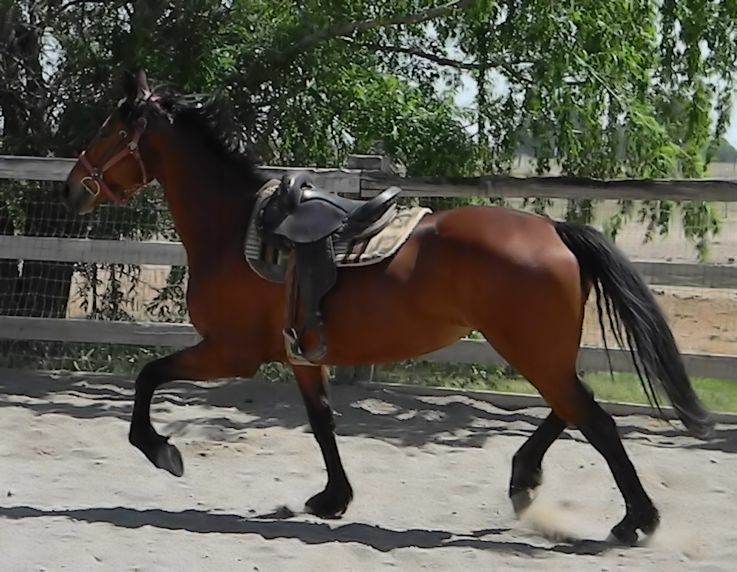 I even made it clear that I didn’t mind if she never made it past a little bit of trot work under saddle. In the end, I got none of what I was after, but ended up with much more than I’d bargained for! In two previous posts, I gave the background on my ill fated decision to send my mare, Tally, away to get started under saddle. In the second post I covered the behavioral problems on the ground that resulted from her time at the trainer. In this post I will describe the major problems I uncovered as I began to put her back to work – issues that I’m still working to extinguish. simply walking out onto a circle, was met with a toss of her head and an argument. She’s always been a bit “haughty” when pushed – but this was almost preemptive on her part. She would settle by the end of the session, but every moment was spent in a battle of wills … and I didn’t know over what! My Solution: It took me a while to realize that I was dealing with a habitual pattern, developed at the trainer’s, and that I had to break it – time was not going to take care of it. Once I realized that it was a learned behavior, and not just an attitude problem, the solution was easy – I broke the pattern. Each day, instead of starting off on the lunge, I would do simple things – take a stroll around the ring, walk over obstacles, stand and practice backing up or moving over. Gradually she would relax during these activities, and I would move into the lunging. It was magic! Within a week she was relaxed from the beginning; by the end of a month, I could dispense with the preliminaries and move right into lunging with no challenges. Problem: This was the problem that proved just how much damage was done in her time away. 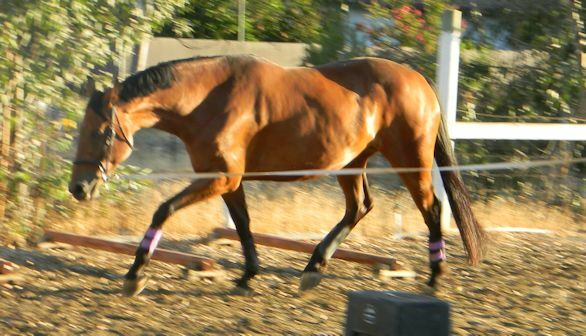 Our lunge sessions had been challenging, but I was not prepared for what happened the first time I asked her to canter. The instant I gave the voice cue (the trainer and I use the same one), Tally reacted as if someone just hit her with a high voltage cattle prod! The response was immediate and intense – she took off in what I can only describe as a panicked run. It took all of my strength to hang on to the line, and several minutes to finally maneuver her into a forced stop. The look on her face was pure panic, and she could not hear me physically or verbally. I managed one more try, this time more prepared, just to be sure it wasn’t an anomaly – it was not! As I reeled her in for the second time, I noticed that she was trembling. I walked up in a feeble attempt to comfort her … and stood sobbing onto her shoulder. light boned long legs, so balance on circles is a challenge for her. I found out, too late, that the trainer ran her around the round pen everyday before she got on. 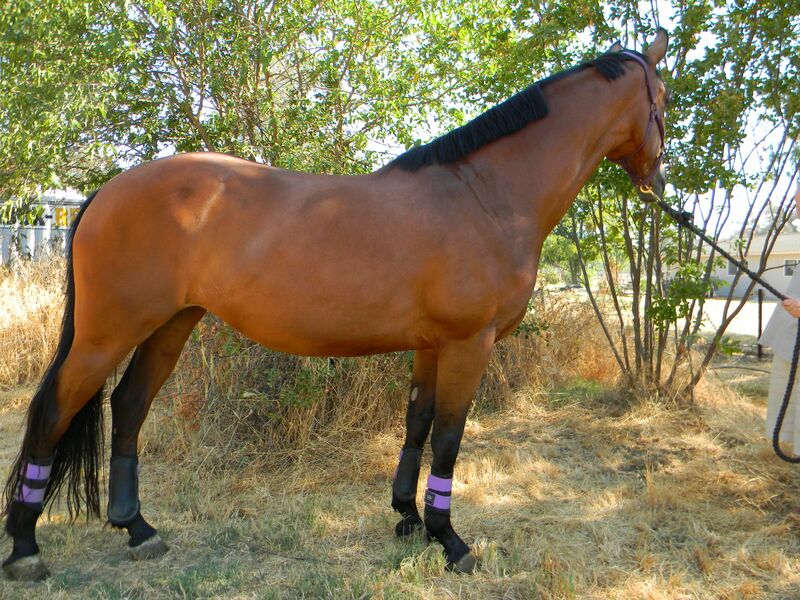 This would set up enough of a challenging situation for a somewhat hot balance-challenged mare – but add to this her injuries gained just a couple of weeks into her stay there, an extremely painful hind leg and a sore back, and I believe that the canter aid gained a strong association with pain. Probably the first stride of canter would spark pain. It’s likely that she then would break, and the trainer would insist – eventually conditioning her to just run through it, and cementing the association of the voice cue with severe pain. My Solution: My first step was to back off of canter. I had to deal with all of her other issues and hoped that time, trust and condition would do the trick. Every few weeks I would try again, just to see if we were making any progress – but as well as she was progressing with everything else, it all went out the window the minute I would give the canter aid. After a few months with no change, I decided to approach canter through the “backdoor”. Before she’d gone away I taught her to jump on the lunge, so I decided to use that as a way to get canter without needing the aid. It worked – she would land off the fences in the most relaxed, beautiful, balanced canter. I’d let her go for a circle or two, then bring her back. A few days a week, for several weeks, we would work on this. It allowed me to condition her – but it did nothing to diminish her reaction to the canter aid. resolving, so I decided it was time to take a direct approach. We were nearing a year since her return from the trainer, and I had regained most of her trust – so I took a chance and cashed in some of it. I asked her to canter, but at the moment of explosion, before she could get her flight response in full swing, I’d ask for “whoa”. The first few times it required some dramatic moves to get her stopped – but it was not long before I found her actually listening for the “whoa”. 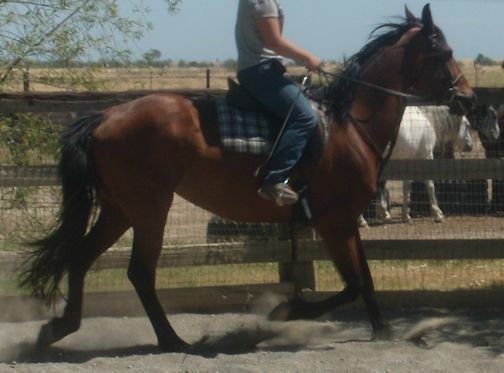 For several sessions, we rarely got more than two canter strides in a row, and somewhat dramatic ones at that. But, considering how many months it took us to get there, she began to catch on fairly quickly. Now, six weeks after I took that approach, I get a normal reaction to the canter aid, and I get canter for as long as she can stay balanced. As soon as I notice her balance waning, I ask for the transition down. The last time we worked, we accomplished two and a half circuits on the lunge in a relaxed and balanced canter, followed by a lovely quiet trot transition. The tears were back, but for a better reason this time! how little response there was to the reins. Had there been response to seat or weight aids, that would have been fine – but there was none of that either. Back at home, when I finally felt she was ready just to walk around under saddle, I’d hoped we would start from scratch – I should have known better by now! I have ridden a lot of horses characterized as hard mouthed, and I have reformed a number of them – but I have never encountered a reaction like this! Or maybe I should say that I have never encountered no reaction at all! It felt as though the reins were tied to the fence. She did not lean or pull against me, but every muscle was completely locked against any and all attempts at influence through the bit. I know how to create a soft mouth – my last mare did Grand Prix movements in a soft rubber bit – but I’d never encountered a blockage like this. along the way she told me Tally had stopped being willing to flex right. Most horses being hollow to the right, this seemed peculiar to me – in hind sight I can trace it to Tally’s injuries, and the extreme pain she showed in the left side of her back on her return home. What I didn’t know was that the trainer employed a running martingale to give herself leverage in the flexion battle. Again, I blame pain association for the end result. My solution: The best way to create a soft mouth is to use very light aids, and immediately release when you get a response. I usually start babies by walking, then sitting still while taking a very slight contact and saying “whoa” – they very quickly begin to associate the change in my seat with stopping, almost negating the need for any rein aid. But with Tally I had to break down the walls first. Andrew McLean, in The Truth About Horses, describes how he teaches the rein aid for “whoa” by first teaching the horse to back from a tug on the reins. So, I set about reconditioning Tally by standing in front of her and applying a slight backward pressure until she took a single step backward, then immediately releasing. Unfortunately, she was so conditioned in her blocking response, that nothing ever happened. So, I “cheated” … she knows “back” as a verbal cue, so I would employ that while pulling slightly back on the reins. It took her a while to stop focusing on the bit and listen to the voice, but we finally started to make strides – backward strides, that is. pressure now is more often to yield softly just before her step backward. As she got better, I would walk with her and apply light pressure for a halt. As she improved from the ground, I started brief riding sessions applying the same principles. On our last ride, the first halt was from seat alone – success! But, just to make sure I didn’t feel too smug, she lost focus after a bit of work and we briefly revisited our old iron-mouthed response. A little refocusing, and we quit on a fairly soft halt. Rome was not built in a day! What a difference a year and correct groundwork makes! I have my beautiful girl back! burden. My friends and family tell me to stop flogging myself for what happened, but that is easier said than done. I will probably always blame myself, but the pain is subsiding with each step forward we make. Our journey is slow, but part of me never expected that we would get this far. If I had to do it all over again, I would keep her home … but there has been some delicious lemonade resulting from these lemons. The work that I have done with Tally, in trying to fix all of the damage, has created a bond that was not there before – and I will comfort myself with the thought that it might not have happened any other way. I now have greater hope for our future together than I ever have! 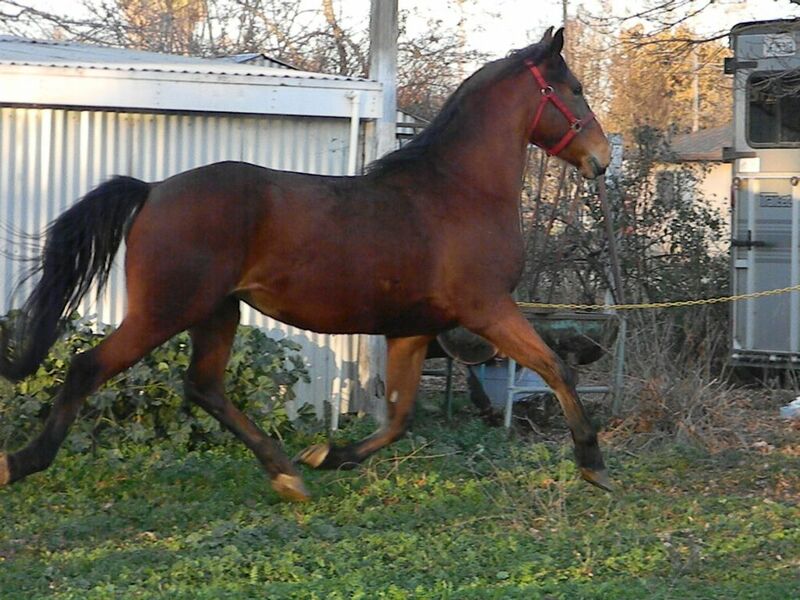 This entry was posted in My Journey and tagged canter, Horse training, iron mouth, lunging, regaining trust, retraining, Tally. Bookmark the permalink. 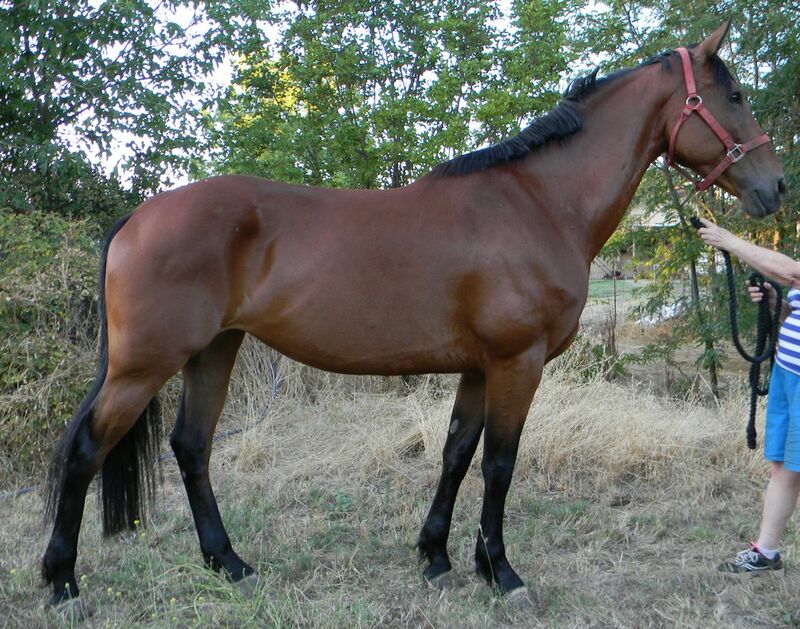 What a pity this lovely horse was so brutalised! It sounds like you should do the training yourself. I encountered a similar problem when I asked so-called experts to trim the feet of my three year old colt. He was twitched, hit and finally made lame. That is when I realised I ought to do it myself. He trusts me and I’m learning along the way but it’s always very calm. How horrible for your colt! I’ve learned, through this experience, that the relationship we have with our horses is the key to their comfort in learning, and makes up for anything we lack in knowledge or confidence in our own skills. I had the expertise to train Tally, but after all these years passing, lacked the confidence. I am just grateful that our horses have such a tremendous capacity to forgive us!